There have been a number of Deac families on our Facebook site (Wake Forest Parents) with questions about Commencement. The Commencement web site is the place for all official news and information about Commencement, and I advise all families to go there first (there is an excellent series of FAQs). But having graduated from WFU and as a longtime staff member, I’ll offer a few unofficial pointers of my own. Watch the forecast and prepare accordingly (bring raingear and umbrellas if needed, etc.). It’s wise to layer your clothing. It could be warm or cold, there could be wind outdoors or if we are indoors, you could be seated near an air duct. Better to be able to add/subtract a jacket if needed than to be too cold/warm all day. Wear shoes that you don’t mind getting muddy or wet. Even if it is bone dry the day of Commencement, there will be dew on the ground overnight, and that wet will be in the grass. Once you add 10,000 people walking on the same swatches of Quad grass between the chairs, it has the potential to get muddy. Shoes – especially fabric ones – can get wet and dirty. Along the subject of wet, the chairs on the Quad will have dew from the night before. Bring some paper towels to dry off your seats, or bring your own hand towels from home so you have a dry seat. If you forget to bring a towel, you can simply tilt the chair forward to let the water run off and squeegee the chair as best you can with your hand. Wear sunscreen. 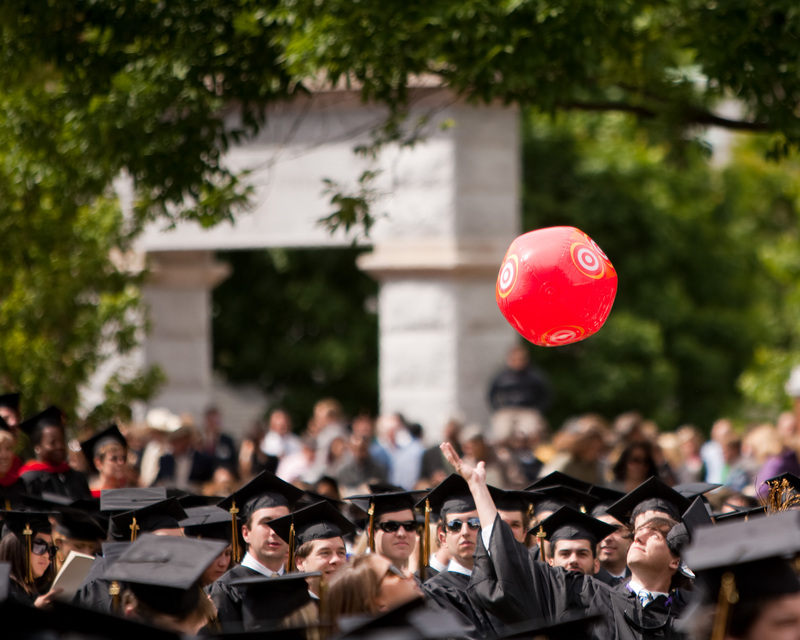 Graduation on the Quad is normally just shy of 3 hours, starting at 9 and ending around noon. While we do have trees on the Quad, many seats will be in full sun, and you don’t want to have a nice sunburn as part of your Commencement memories. Be mindful of older relatives who might not like the heat of the sun or who would prefer close and easy access to restrooms. Family members who don’t want to sit outdoors can watch in Pugh Auditorium in the Benson Center, where it will be simulcast from the Quad. There will also be a live webcast on the morning of Commencement via your laptop or computer. There are bathrooms available in the Quad buildings as the ceremony occurs, but lines can be long. If you don’t want to wait in a long line, walk over to the Benson Center or Scales Fine Arts Center. Those are a slightly longer walk, so fewer people go there. Also, there will be executive portajohns (which have sinks and running water – really, they are nice) and often those have smaller lines, so use them. There will be places on the Quad where you can purchase coffee, water, etc. You will not be allowed to bring a cooler onto campus. There is a break in the ceremony after degrees have been conferred to graduate and professional school students. During this break, those students process to their individual school’s ceremony, and their families move to those locations as well. Therefore, there will be a lot of seats opening up as those families move to the next ceremony – and if you want to move forward to better seats, you may. So plan ahead, especially in terms of your personal care and comfort and those of your family members with you, and it will be a great Commencement for all! NOTE: in the event we have to go to the rain plan, obviously that would change things. I wrote this with a Quad graduation in mind, but know that some of these things would obviously change/not apply if we were at the Joel Coliseum for the rain plan.